Bee-Line ground level storage containers offer a safe, secure and convenient walk-in storage solution. Manufactured with heavy duty steel walls and marine-grade hardwood floors, our containers are durable enough for industrial use as well as clean enough for household and retail storage. Bee-Line’s storage containers are available in a variety of specifications to suit all your ground level storage needs. Our inventory of 10, 20, 24, and 40 foot length containers have swing doors (some on both ends.) Our storage boxes are 8'6" or 9’6” high, and all of our containers are clean, and lockable to protect your valuable merchandise. Don’t be fooled by light duty, non-steel storage boxes like pods that do not completely protect your assets. 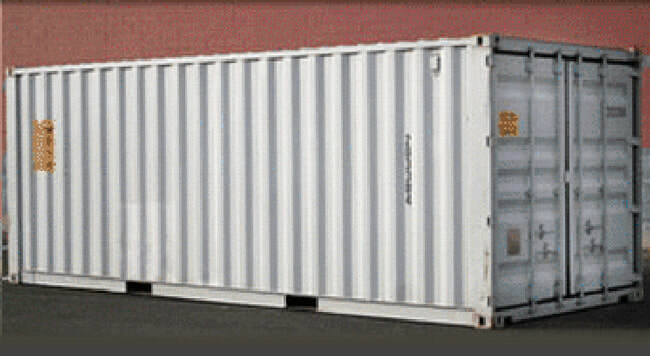 Our storage containers are significantly more secure and durable than most cheap imitations. Bee-Line containers are a smart and practical alternative to lower cost storage or other lightweight, storage competitors. On-site commercial and residential storage needs are best met with our economical, strong, solid metal construction container rentals. Business Owners – retail, wholesale, construction, professional services, manufacturing, etc. – can rent a storage container to safeguard valuable inventory, records, parts, tools, equipment, building materials or supplies when space is scarce. leasing a Bee-Line container is a far more cost-effective and convenient alternative to renting warehouse space off-site, or building-out your facility. Home Owners – attic, basement, and garage space is limited for household goods, vehicles, and tools. Old furniture, disconnected appliances, and other possessions, can be stored in a Bee-Line Storage container that allows on-site access to everything in storage. You provide your own lock for total control of your property. Clean out the cellar or garage to make room for the car. Rent a Bee-Line container today. The helpful staff at Bee-Line suggested the correct size storage container that my college needed and delivered it quickly, at a reasonable price.